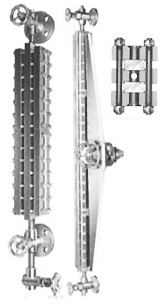 PRINCIPLE Flat tempered glass is mounted on each side of the liquid chamber and held between gage covers. Liquid level, boundary level and liquid color are observed by the differece of transmission of light emitted from the illuminator behind. NIHON KLINGAGE is able to offer Reflex Type for the highest pressure and temperarture application in the world. For emergency, upper and lower Check Ball Valve are standardized. NIHON KLINGAGE is ready to design Transperent Type Level Gages according to customer’s requirement. 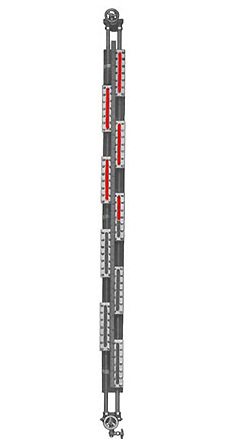 Alternate arrangement of gages in double lines enables to observe continuous liquid level over the whole visible range. These gages are used for such as storage tank of LPG. Carbon steel (S25C､A105), stainless steel (SUS304､SUS316､SUS304L､SUS316L), Titanium, Monel, Hastelloy and various Resin linings are available.